Because the Related Events Body diagram was small, and also because there is no "mouse over" function on the Mobile application, using the Body Diagram to select Related Event forms was difficult. It has been disabled now and all of the Related Event forms appear as buttons. 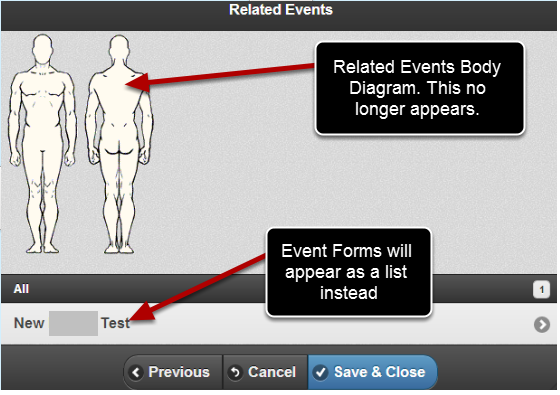 The Related Events Body Diagram will no longer be available to enter Related Events from on the Mobile app. The Related Events will appear as the Event Form name instead (as shown in the image below). The Related Events appear as a list now. No body diagram appears as at all. Prev: When any new versions are available you will be prompted to reinstall the Smartabase software.